Announcer's booth: Give a play-by-play of the game based on real game clips, with the ability to capture their commentary, add sound effects, and play it back to hear their broadcast. Fan club: Customize baseball cards with a favorite team logo, or dress up as a player and take a picture! Keeping score: Answer trivia, calculate batting averages, and solve physics-themed challenges. Live game coverage: Interview players, coaches and fans using a real camera and green-screen technology. Ballpark experience: Use props and costumes at ticket sales and concessions. Pitcher's mound: Review tips for proper pitching, take the mound and pitch into the strike zone...or, be the umpire and make the call! Batter up! 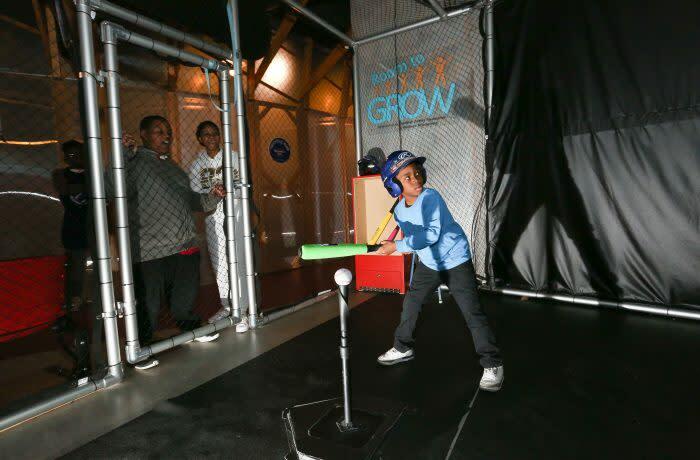 : Master a great swing in the on-deck circle, and step up to the plate where a digital screen records the swing count, displays the ball's trajectory, and reports the outcome based on the hit. Who's on first? : Communicate with a virtual first-base coach on scenarios, strategies and projected outcomes for second base. Get a grip: Simulated plays prompt players to throw from the infield or outfield...is it a catch, an out, safe at the plate, or an error? Keep your eye on the ball: Grab a glove and catch motorized fly balls!